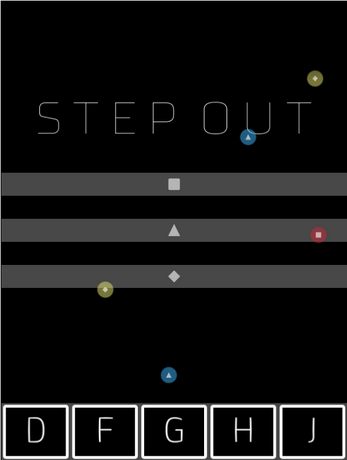 Step Out plays just like your usual rhythm game. Except that the rhythm is a mess, and every time you press a button you break something. This game was created in 48 hours for the 2018 editions of both the Music Game Jam and the GMTK Jam, which theme was “Genre without mechanic”. Also, while this is technically not a rhythm game, it's still a musical one! So make sure your audio is enabled. Pick the one that suits you the most. You can also mix them if you feel it necessary. In any case, don't worry if controls are not immediately intuitive. It takes a little while to learn. My best advice is to find a good position for your hand(s), and stick with it. Part of the game's challenge is figuring out its rules! So I suggest you to play it a while before reading this section. Notes fall from above in an inactive state. There are 3 colors of notes. Each time you hit a color, you activate the note, and you start a combo. The combo value will increase each time you hit a note of that color. Also, the more active notes there are in the color, the more score you will make when hitting a note (combo will be multiplied by the number of active notes). Thus if you want to get a big score, you must try to activate several notes of the same color. The combo breaks if you miss one active note of the color (inactive ones have no effect when missed), or if you push a key without hitting any note. At the start of the game, you have to fill each color's bar. The bars work just like combo: the more active notes there are in the color, the faster it will get filled. However, it decreases each time you break a combo (missing an active note or hitting a wrong key). Once you finished the game, you can still try to reach an high score. When you start a combo, you can see its value on the left of the corresponding bar. And on the right is the best score you've obtained with one combo. I can't even play this game its so hard for me . Haha. like Pong with 5 separate paddles. I like the concept though. Great work! I was worried when I read the instructions because I'm not big on non-intuitive controls but it wasn't as bad as you made it sound. Nice job. I finished the game and it felt very satisfying. What I think is lacking in the design is the distinction between notes. My strategy was to focus on each note at one time, and so it makes 3 distinct levels in one game if you get what I mean. You mean the three colors of note? If so, your strategy is actually the one intended: focusing on only one color, and ignoring the two others (actually they become some kind of obstacle). This way bars are filled one at a time. Unfortunately I feel like a lot of players are trying to hit absolutely every notes (which is nearly impossible). I think I need to find a way to encourage them to focus on one color / symbol only. 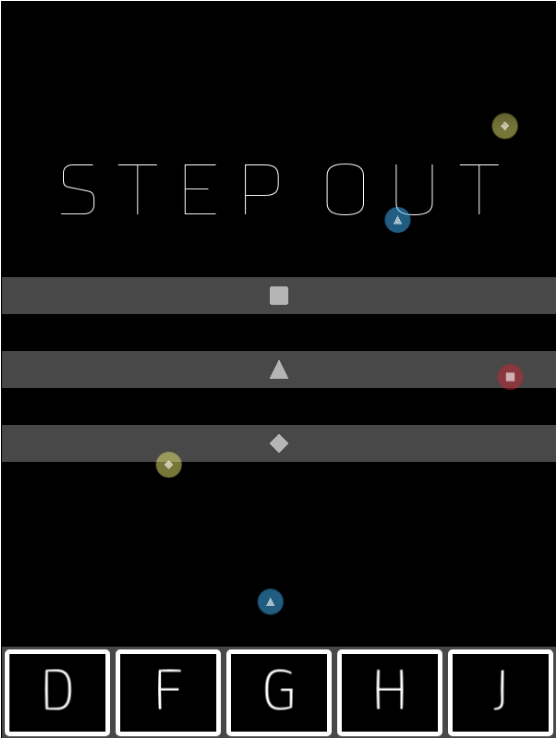 Step Out is the definitive game in the avant-garde jazz genre. I wasn't sure if I was playing a game or creating a jazz masterpiece. If you ever want to mix this with different styles of music, I'm in. That's nice to hear! I really wanted to create a pleasant music experience. I'm happy that you liked it! While I don't intend to update this game, I make mostly musical games. Just like in this one, I want to let players create their own music through interactions. I certainly will continue to explore this idea! Incroyable - on se surprend à réussir des moments improbables, et puis parfois ce qu'on tient se brise totalement. Il y a une dualité entre le moment où l'action se rythme se comprend, et le moment où tout s'est accumulé et empêche de survivre et on déraille sur les 5 touches : ) Bravo ! Très belle réponse à la Gamejam de MB ! Merci ! J'aime bien les systèmes qui échappent peu à peu au contrôle du joueur. Celui-là est un peu brutal dès le début, mais j'espère rigolo quand même. This was super cute! It started off with just a cacophony of noise as I was learning the mechanics, but became semi-coherent as I got a handle of it while still making all sorts of mistakes. Really fun and imaginative. I'm glad you had such a nice experience! Thank you very much for your feedback.